How do you run a meeting? How big can a simple church grow? How do you multiply? How do you involve the kids? How do you maintain doctrinal integrity? These, and others like them, are often the first questions I’m asked about simple church. However, bear with me when I say that how-to questions are not the place to start. If a couple came to you for premarital advice, I’m pretty sure you’re not going to have to cover, “how to run a date” for example—not because it’s unimportant, but because it’s almost irrelevant. Giddy for each other, the love-birds cannot be prized apart; how-to’s on spending time together are about as relevant as explaining ice to an Eskimo or sand to an Outbacker. Helping the couple identify and affirm their mutual values is the place to begin; the how-to’s flow out of the couple’s rhythm of life together, increasingly in sync because of the affirmed values. In the same way, the how-to’s of simple church flow out of a community’s shared values, and these values are found in asking these questions: whose, who, whom, where and why? A Kingdom family alive, in love and on mission together will find their own groove, carving out a rhythm of communal life that will answer many of the how-to’s before they’re even asked. Continue reading as we look at these values-based questions: whose, who, whom, where and why. So, how do you make a simple church work? It’s our human nature to try to map out everything before we try it. Of course, counting the cost is important—Jesus was an advocate of this too (Luke 14:28)—but ‘needing’ to know all the mechanics or how-to’s of something before taking a step forward, is a different animal altogether. And this is especially true when it comes to the life and adventure of faith. Our ‘need’ for control will keep us imprisoned in the past, the comfortable, the status quo. Faith is spelt R-I-S-K, and giving up ‘control’ is the first step to a life of adventure. And since there’s no magical formula to implement or sanctified method to duplicate; trying to master all the “supposed” mechanics of an A+ Kingdom community will not only give you a throbbing headache, but produce a lifeless, truncated, watered-down version of some preconceived idea. I think the saddest thing in this case, is the missed opportunity to journey with God as a community, allowing Him to birth something original, unique, one-of-a-kind in your collective midst—a never-before-seen salt-and-light ecclesia. (Of course, by simple church in this article, I’m referring to far more than just a meeting that happens in someone’s living-room on a Sunday morning or Wednesday night). Okay, let me then outline what I feel are core values that answer the whose, who, whom, where and why questions. While there are any number of unique values specific to you and your community, these may serve as a backdrop to identifying and affirming them. 1. An essential first-hand relationship with God, grasping His Fatherhood and our sonship. Whose am I and who am I? This may sound uhh-duh obvious, but the reason God is challenging our false dependencies and misplaced loyalties is to bring us back to the simplicity of utter devotion to Him (2 Corinthians 11:3). Too often we’ve tried to grow our love-life with God by ‘dating’ an organisation or denomination, a pastoral system, a preacher, a worship service, or style and method of church. Grasping the Father-heart of God, responding to His functional fatherhood—as opposed to merely a notional sense— in our lives is the overwhelming message of the New Testament (John 14:6; Romans 8:14-17; Hebrews 12:5-11). This answers the question of whose I am. God has, in essence, revealed Himself as a Father, and we are His. God’s love is selfless, sacrificial and unconditional … beyond human comprehension (without the Holy Spirit we don’t stand a chance of even understanding an iota of it). Until we grasp God’s Fatherhood, we’ll always be looking for something we already have in Him. We’ll use people, burn through church models, champion trivial pursuits, become snagged in distracting arguments, and more—more being the operative word—seeking to fill the void in our soul only the Father can heal. Flowing from an overwhelming revelation of God’s Father-heart, we’re then able to answer the question of who I am. We are—nothing more, nothing less—sons and daughters of God (John 1:12). This is the supreme privilege and amazing responsibility of the redeemed. Think about it. We get to call the Sovereign Master of the Universe, “Abba”. Without a grasp of my identity as a son of God, I’ll never be secure in the love and grace of God. Instead of being a true servant, I’ll become a paranoid slave desperately seeking the acceptance and approval of others. Rather than being a faithful steward of all God entrusts to me, I’ll become a stingy hoarder of what I think is mine. Instead of being a victorious soldier fighting the battles of the Lord, I’ll become an off-the-reservation renegade fighting battles that feed my ego or advance my cause. Only when I understand that I’m a son, can I be a pure servant, an effective steward and a vigilant solider. Sons first! I suggest that every Jesus-follower and every simple church community devote time to regularly refresh this core value. It’ll flush out a swarm of gremlins in your own soul, and debug your community of a host of viruses. I’ve written an article on the Father-heart of God that you and your community could use to facilitate discussion around this issue. 2. An intentional, communal lifestyle with a primary group of relationships. As followers of Jesus, filled with God’s love for every creature, we show the Father-heart of God to every person we meet—regardless of their race or religion, colour or creed. Right? I reckon Jesus told us to share God’s love with “every creature” (Mark 16:15) so that we don’t get to decide whose worthy or not. If it breathes, love it! (Common sense prevents us from preaching to our dogs and pet tarantulas). Having clarified that every person God brings into our orbit ought to collide with God’s love in us, we are also called to “do life deeply” with a primary group of core relationships. The New Testament reveals over thirty “one another” exhortations only consistently possible in the context of a primary set of relationships (see Romans 12:10, 16; Hebrews 3:13; 10:24, 25 for instance). However, as we “do good to all,“ we recognise that we can only dwell with a few others in a meaningful way. Thus, depending on what kind of social animal you are, we’ll have a second, third, fourth, fifth and (…) set of relationships in addition to the primary set we feel God has knit our hearts to. By “primary relationships” I’m referring to discerning the core relationships God is knitting your heart to for the foreseeable future. We simply cannot invest ourselves deeply in this way in everyone, but we can, along with our spouse and children, give ourselves to a core group … while primary relationships are not exclusive relationships the issue here is this: To whom are we accountable? Where are we known inside out? Where do we confess our faults (James 5:16)? With whom do we seek counsel and confirmation as we make big decisions in line with our prophetic destiny? This is where our primary relationships matter. And if—and this happens in our busy world all the time—we have to make a choice as to where we will spend our time, we give our choice time to our primary relationships; unless the Spirit of God directs us on that particular occasion otherwise (in which case, the people in our primary core cheer us on, celebrating our courage to follow His lead). I don’t think trying to “find a church” or “join a group” necessarily answers the need for a primary set of relationships. While it may happen by accident, I’m convinced God’s design is completely different. The question we ought to ask is, “With whom has God called me to walk?” This is not about organisational membership or religious affiliation—this is about intentional, spiritual relationships. It remains the Father’s great delight to “set the solitary in families” (Psalm 68:6). Our role is to discern with whom God has entwined our spiritual journey. Biblically, we’re called to be “members—parts of a body—of one another” (Romans 12:5), not “of an institution”. In other words, don’t feel obliged to join an organisation; instead, identify and affirm the relationships you may already have in the Lord. Then be initiative and intentional about exploring a communal, missional way of life together. 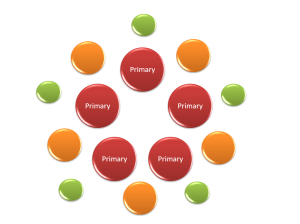 The red circles represent a primary set of relationships, the orange a secondary set, green a third set and so on. While we’re not categorising people (notice, there are no borders in the diagram), we do need to recognise which relationships are primary in our lives. Due to our human time limitations—we only have 168 hours in a week; no more, no less—and being true to our God-given connections, we simply cannot give ourselves meaningfully to everyone. We’ll burn out and be no good to anybody. (And remember, this is not an introspective clique, rather its purpose is outward and missional, as we’ll see in the next point). As we cooperate with Father God as a set of primary relationships, we unwrap another salient value; that is, we understand church essentially as a Kingdom family—not a business enterprise or religious organisation. In fact, this core value answers just about every how-to question in one slam-dunk: How does a family meet? How does a family grow? How does a family multiply? How does a family involve children? How does a family resolve conflict? Have you identified your primary relationships? Having done so, out of a fresh grasp of God’s Fatherhood, seek to unpack the treasure involved in being a spiritual, Kingdom family. I’d suggest you look at this article, What are Hebrew values? as a powerful place to start this conversation. 3. A Kingdom, missional vision and shared resolve to embody it. What’s the primary motivation for being together? Love! For sure. However, inward-directed love can only produce a reasonably good social life (and even this, usually has a shelf-life). Outward-directed love—the God-kind-of-love captured in the Greek word agape—produces sustained fellowship as a by-product of a thrilling missional adventure. Allow me to explain. If a simple church family does not have a missional base, the community will become inward-looking or even implode within 18 months. Fellowship is not the goal of a Kingdom community, cooperating collectively with Father God’s redeeming work in our world is—in a phrase, Missio Dei, the “mission of God”. Fellowship (Greek: koinonia) is the God-given blessing or result of a Kingdom ecclesia “about their Father’s business together”. When our goal is fellowship, it’s as elusive as a slimy bar of soap; when we aim at mission, we’re baptised in koinonia from above. A healthy Kingdom community is alive (in the Spirit), in love (with one another) and on mission together. Without “…and on mission together,” the communal life of a simple church often becomes self-absorbed, and the missional adventure deteriorates into a “schedule of meetings”. The only community “news” becomes, “When is our next meeting?” Life in the Spirit wanes and petty issues become major obstacles. Our revelation of Jesus must inform our sense of mission, which in turn, seeds our understanding of the ecclesia. Without a clear and profound revelation of Jesus and His mission, we’ll play a game called church … and wonder why we end up bored to tears. So, how does a Kingdom family nurture a missional heart and impetus? I believe there are several issues involved, and cover these in the article, What does it mean to be missional? However, suffice to state here, a missional base does not necessarily mean a community must immediately adopt a project. While looking for a sizeable “need” is not hard to do—in Africa, for example, you need just a throw a stone to find a verifiable situation crying out for help—developing a missional heart begins first by profiling the individual sphere of influence of each person in the group, and then defining the aggregate circle of impact these spheres make. This may then result in various projects emerging from the group as they respond to God’s promptings. Every member of the simple church family has a sphere of influence—whether this be one’s neighbourhood, one’s work place or one’s social circle. And it’s within this God-given sphere of influence that each person reveals God’s love and life. As a primary set of relationships then, take an active interest in each other’s missional influence; pray for those without Christ in each other’s spheres, get acquainted with God’s purpose behind each other’s work or career, and serve each other where needs become apparent. 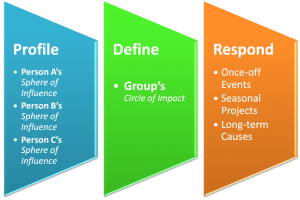 Profile these individual spheres regularly and, in giving space to listen to what Father God might be saying, define the group’s combined circle of impact, discerning whether there are some joint projects that are percolating in the mix. These projects might involve a once-off event, such as a “Matthew party” (Luke 5:27-32) in which you invite several not-yet believers from your circle of impact to an appropriate social outing. It might be a commitment as a group to serve somewhere for a season of time, or might involve a medium to long-term initiative around a prophetic cause that has gripped your collective imagination. Profile, define and then respond as God leads. Loads of fun and bonding, and prayer and soul-searching occur in this discovery process as you collectively grasp God’s missional heart … and one thing you won’t be short of is fellowship! A Kingdom family engaged in the thrill of missional adventure, discovering their “where,” won’t be wondering, How do you run a simple church meeting? 4. 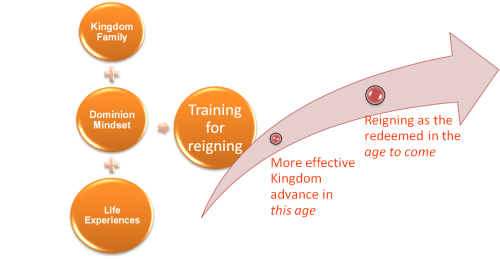 A Kingdom, dominion perspective of our purpose in this age. The question Why? is always a good question to ask, as it pokes at our base motivations. And yes, Jesus should be the overwhelming, defining reason why we do what we do. However, here we’re asking, Why is God doing what He’s doing? Why is He reminding us of the centrality of His Kingdom mandate? Why is He calling us to rediscover a greater simplicity in our devotion to Him? Why is He deconstructing an institutional construct of church? If we don’t grasp (or at least grapple) with this over-riding why question, we’ll settle for how-to methods and formulated systems. And as far as settling goes, these mechanical and clinical formulae will never make for great companions. They’ll relentlessly run you ragged, sucking the life and joy from your soul. even as we collectively learn to drive back the kingdom of darkness in our world (Ephesians 6:10-18). Why is God doing what He’s doing today? So, we His ecclesia—every single one of us—take up our responsibility to govern, to advance His dominion mandate on the earth. In a Kingdom family, there are no passengers; it’s every hand to the pump. Every contribution, no matter how seemingly small, is vital for the functioning of the whole. In pale contrast, in an institutional construct of church, a small group shoulder a back-breaking overdose of governmental responsibility, while the majority aren’t allowed in the game at all. God is restoring the brotherhood and priesthood of all believers so that as Kingdom families, we’re all engaged in the work of God. Yes, some will carry more responsibility due to their maturity and grace; yes, we all have different gifts and passions—we’re not conforming down to some colourless, uniform one-size-fits-all straitjacket. No sir! We’re being transformed into the multifaceted, multidimensional beauty of the Head, Jesus Christ—and as we all offer our contributions, we display the “manifold wisdom of God” (Ephesians 3:10). So, to be crystal clear then: everything we do, in every challenge or victory, we’re learning to govern. In a phrase, we’re training for reigning; we’re progressively growing into our dominion destiny both in this present age, and in the age to come. Paul explained to Timothy, in a mind-blowing statement, “godliness is profitable for all things, having promise of the life that now is and of that which is to come” (1 Timothy 4:8). Our dominion destiny is to rule and reign as the sons of God. We’re called to advance His Kingdom rule on earth now—in this present age—and our faithfulness to this mandate has a direct bearing on our potential in the coming age, the age inaugurated by the return of Christ (Matthew 25:14-30; Luke 19:11-27; Revelation 5:10; 22:5). Wow! In every challenge we face, as individuals and as Kingdom communities; in how we steward our time, talent and treasures; in how we manage our interpersonal relationships—including how we deal with offence and how we resolve conflict—we’re harnessing our dominion potential. We’re learning to govern now, advancing His Kingdom on earth as it is in heaven, and we’re preparing for governing in the age to come. In other words, simple church is not just about a hip, new reshuffling of the proverbial church furniture. It’s so much more than merely moving our meeting from a church-building to a lounge-room. We’re talking about a change of mindset, not a change of venue. And a simple church family is simply the best “means”—I believe, the God-designed means—for training for reigning. After all, an institution, no matter how modern and innovative it might be, is always a poor, only-when-absolutely-necessary alternative. Where does a child grow best, in a family or an orphanage? So, how do you make simple church work? We can’t … any more than we can make ourselves fall in love, or force a fruit tree to produce fruit. An essential first-hand relationship with God, grasping His Fatherhood and our sonship. The Whose and Who questions. An intentional, communal lifestyle with a primary core of relationships. The Whom question. A Kingdom, missional vision and shared resolve to embody it. The Where question. A Kingdom, dominion perspective of our purpose in this age. The Why question. What Do You Mean, Incarnational Mission? Can Anyone Start a Simple Church?